Finnair Rating: 4 out of 10 Reviewed by Airreview from 54 flights with 123 photos. Finnair is to improve business class, removing the angled lie-flat seats on board the A330 and A340s and replacing them with fully flat beds. The Zodiac Vantage seats are already found on one of Finnair's Airbus A330 aircraft, and will be installed across the rest of the airline's fifteen-strong longhaul fleet. Finnair has undergone a large degree of fleet rationalisation and is now firmly an Airbus customer; a big change from a decade back when it had a decidedly mixed fleet of Airbus, Boeing, and even some old McDonnell Douglas planes. These have all gone, and now Finnair has a small fleet of the classic Airbus widebodies, the A330 for shorter routes with better fuel economy, and A340 for longer ones, and narrow-body A320 variants short-haul. 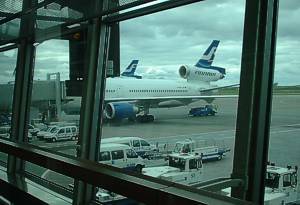 On most routes, Finnair operates two class planes. Economy is just that, whereas Business Class can vary wildly from plane to plane. Finnair Premium Economy is something that the airline has reported looked at, but as yet made no plans in that direction. Instead there is the famous ‘mini-cabin shuffle’ on the A330s. 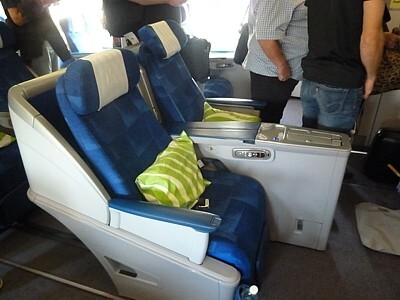 Here, the smaller rear business class cabin with just two rows of seats– is typically left un-bookable by Business Class passengers, unless enough full fare business class seats have been sold. Then at around 48 hours before check in, economy class passengers with elite status (typically Platinum only) are moved up to the mini cabin. You still get an economy meal. But a business class seat. This shuffle seems to happen on a regular basis for some routes out of Asia, but never on others – to see if it is likely, make a dummy booking in business and see if the mini cabin is available for seating. On some "tourist" routes (as it politely calls them) Finnair is firmly one class only - economy: these are between Helsinki and Bergen, Budapest, Dublin, Murmansk, Prague, Riga, St. Petersburg, Tallinn, Vilnius and Warsaw. At all seats in all cabins on the Airbus widebdy aircraft (A330/A340) you will get a seatback TV on Finnair: Finnair's inflight entertainment and seatback TV. On the 757s and A320s there is only a simple overhead video system. Longhaul Finnair Business Class comes in three variants, but all three have a very good seat. On the four 777s leased from Jet Airways, the seat in turn was licenced from Virgin Atrlantic, and it is the classic flatbed on a curve business class seat. You fly at a 45 degree angle to the direction of flight (so you can't see much out of the window), but otherwise it's pretty nifty. 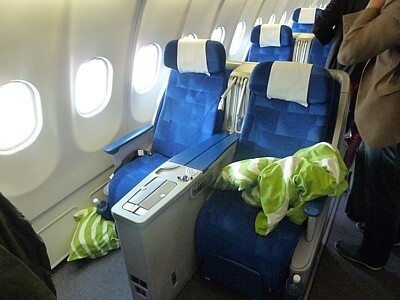 Slightly poorer is the classic Finnair Business Class seat, which has a seat pitch of 60 inches. 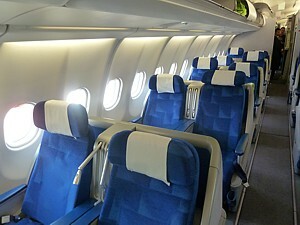 Seats are very conventional, facing forward, in a 2-2-2 configuration. Finally, there is the new seat. Reviews of the new Finnair Business Class seat are good: it electronically reclines to a 75 inch (188 cm) long bed, but it has some major drawbacks: it goes flat but not completely level; your feet stick into the hole on the ottoman under the seat infront, and it isn't very private at all: there is a smal privacy screen, but you are again sitting next to your companion, with a 2-2-2 layout. It is only on the brand new B777-300 and A330-300 fleets. Finnair's Economy Class on the A330 and A340 aren't great, but come with a marginally better pitch that you'd expect. Pitch comes in at 32 inches - an inch more than most airlines, although it really doesn't feel that much better. However Finnair's Airbus aircraft do offer a 2-4-2 layout in economy, which means you only have to (at worst) hop over one other person to get to the aisle, and this also gives a respectable width of 18 inches. Width, rather than pitch, often defines seat comfort in economy, and here Finnair are good. Finnair has five A340-300s, which with four engines are used on the longest of long haul flights, and another five of the twin-engined A330-300. The A330 aircraft is used on shorter long-haul routes, such as New York, Seoul, Delhi, and Nagoya. Originally Finnair ordered the latest A350, however the huge delays Airbus faced means that Finnair took the A330 instead. However the A330 doesn’t have enough range to get to Singapore, where the A340 is used. However (again) construction of the A340 had finished by the time Finnair found it needed some, so it was forced to take a couple of second hand Air France aircraft instead. These should be avoided, as they have seatback TVs, but with channels instead of AVOD. On both the Airbus A330 and A340, there is dedicated snack bar in business. There are no less than three different types of A330-300. There are 4 with 42 in business, 3 with 32, and one amazingly new one with 45, while the A330 has 229 down the back in economy, although this number again varies according to type. The Airbus A330 aircraft are part of Finnair's long-haul traffic fleet modernisation, which replaced the ancient MD-11s. For IFE, the Finnair A330 have seatback TVs and AVOD in all classes, and power points for laptops. It also possible to send text messages during flights. 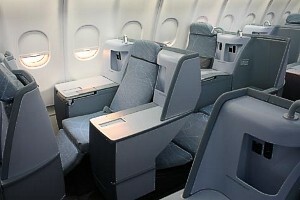 On most models of the A330, Business Class comes in two cabins with a 2-2-2 layout. The main cabin is in row 1 to 5, and after the second set of doors there is a mini Business Class cabin in rows 6 and 7, just ahead of economy. 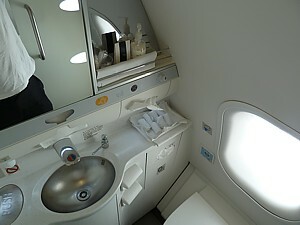 Reviews of this mini cabin are mixed, with some passengers preferring its exclusivity, however other people have the opinion that it can be noisier as it is just ahead of the economy class bassinette seats (the screamer or cot seats, where young children are put on the flip down shelf and often scream thought the flight). There is also the high likelihood on Chinese routes that this mini-cabin becomes an upgrade cabin for an oversold economy class for those with status, where economy meals are handed out, but the seats of course remain business. 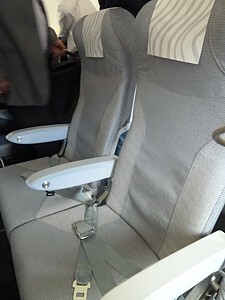 There is one A330 which is unique - and which has Finnair's latest design of Business Class seat which reclines to fully horizontal, as well as a new layout with more seats, offering more privacy than before. There are 45 "Contour Vantage" seats (instead of the 42 with the other A330s) that have been arranged so that all but a few passengers have direct access to an aisle, by staggering the seats with one in a row with loads of cubby holes, then two with a middle table, and so on, hence giving more lockers with storage space for hand baggage. Take this plane at all costs if you can, however you really have to be very lucky to get one of these aircraft: look for the special seating plan when you book your seat, and if it isn't there, change your flight. It is typically used on the early afternoon flight to Hong Kong. Beware however of taking this aircraft if you like to snack in flight: it is one aircraft where there is no snack-bar in business class! Finnair – the only consistency is the inconsistency. Economy is very much that - seats come in a 2-4-2 layout (which for couples travelling together actually works out as a better layout than 3-3-3, since you don't have to hop over someone to get out. It's got a 32" pitch, and an 18" width. The first row of economy is row 21 (or 22ACJL on the A330), which is a bulkhead, with the bassinet (screamer is the Finns word for it, or infant cot) seats so you may be sat next to a child for 12 hours, however it does have a bit of extra legroom and a TV plus flip down table in the armrest. Row 41 is the emergency exit row which is a favourite among regular fliers, with a lot of extra legroom and TV screens in the armrests (which alas means the arms don't move up). Here the bathrooms are just ahead of you, so passengers tend to group around here in flight. There are seven Finnair Airbus A340-300, however these come in three different types, and it’s crucial to check which one you have, otherwise you may end up on one of the old Air France birds – not a nice ride in Business. Most (four!) of the aircraft were specially ordered for Finnair (OH-LQB, -LQC, -LQD, -LQE) and these are the ones which are the most standard, with 42 in Business, and 227 in economy, making 269 in total. A slight variant is on the oldest of these planes (OH-LQA) which is missing a toilet at the front of business, but has an extra one at the back of economy, but is otherwise pretty similar. It came second hand from Virgin Atlantic, and it has is no overhead stowage over middle row in business class, resulting in a lovely open cabin, but with passengers fighting over luggage space. 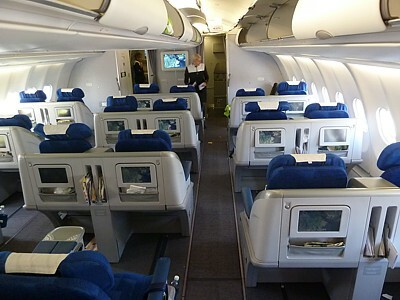 On the four main Finnair A340 Business Class comes in two cabins, with row 1 to 5, and then the mini-cabin 6 and 7. This mini cabin is typically not used as a business class cabin, and instead is kept free, as upgrade space for economy. All the seats are identical, in a 2-2-2 cabin layout, with classic lie-slope flatbeds. They aren’t especially comfortable, but they are serviceable so long as you can avoid your ankles aching after 8 hours lying on a slope. The TV screens are quite large, with AVOD. There is a small self-serve snackbar in the middle galley, ahead of row 6DH. Back in Finnair A340 economy class it’s not too bad – a classic Airbus widebody, with seats in a 2-4-2 layout, which means everyone is just one hop over another person to an aisle. There are two cabins, row 21 to 33, (row 21 is a bulkhead with 2 windows – well worth it) then a bank of four toilets, row 41 an emergency exit (but blighted by lightspill) and row 41 to 56, with 3 rows in a 2-3-2 layout at the back. On the ex-Virgin Atlantic single version (OH-LQA) there are six rows of 2-3-2 at the back, which goes back to row 57. On the four main A340 aircraft row economy 55D is very good, with no seat in front of it (because of an emergency hatch to the hold) and is highly prized. There is however a seat here on OH-LQA, and the French Birds. And then there are the famous ex-Air France A340 flown by Finnair, which are alas used on the longest of long haul flights, normally to Singapore or Hong Kong. They are no-where near as good. In Business the lie-flat seats are older and more vertical. And worse – in all classes there is no AVOD. Films are just on an old fashioned loop. The way to tell if you are getting the former Air France birds (registration OH-LQF and OH-LQG) is that if the seatmaps don’t show 1A and 1C, then you are out of luck and you’re in for a bad ride. Another test is if there are five rows at the back of economy with 2-3-2, and again it goes back to row 57, you’ve got the duff Air France aircraft. Avoid if you possibly can. 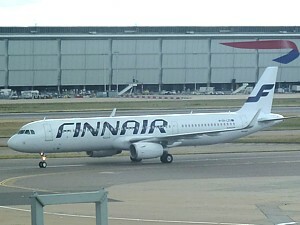 Finnair has a large collection of the single isle A320 variants. All seats are in a 3+3 layout in business and economy, with a business class cabin which is changed in size by moving a curtain. 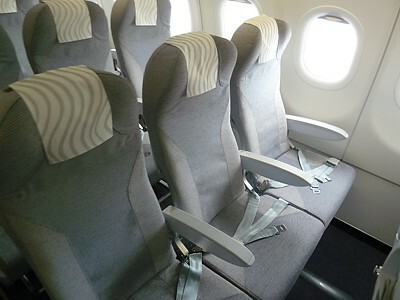 The business class seat is identical to the economy seat, both in pitch and in width, however if you are in business, and sit on the left, the centre seat is blocked off and the seat arms moved across to give a larger seat - accordingly it is well worth asking to sit in A or C in business. Recently Finnair have revamped their A320, putting in a new spacesaver seats in 3-3 configuration, and very tightly packed together. They have stopped selling the middle B and E seats in business, but unless you are in row 1, you will not notice the difference in seat pitch. Row 1 (better on the DF seat, as the bulkhead is further back) is good for legroom in these seats, anything further back is to be avoided at all costs. Seat pitch is 32 inches. All models have large 14 inch fold down LCD TV screen under the overhead lockers for both classes, but no individual seatback videos. There are no headphone sockets or laptop power sockets at any seat. There are ten A320 which seat 144, with the variable business class seats extending back as far as row 20, although in normal configuration they are only used with the first 3 rows as business class. Row 9 and row 10 are overwing emergency exits - if you ask to sit here, you will get 2 inches more legroom. There are only seven of the larger A321 which seat 181 and are comfortable and modern. Service can be a bit slow, with only a single isle for service. There are no over-wing emergency exits, but there is a proper door at row 8 and row 20, so you can as much legroom as you want if you sit in the row behind it, however you do not get an sort of window. Row 6 also has a blanker at the window, so is to be avoided. Finnair A321s are arranged in a very odd format, with a member of the cabin crew sitting next to you in a centre seat in seat 8D and 20D, which can seem a little strange. There are nine of the rather squat A319. This variant is smaller, and has only one over-wing ejectable windows - sit here, in row 9, and you'll get 2 inches extra legroom. Finnair have four Boeing 757 left – the rump of its old fleet, which is now only used for charter flights. Few other airlines fly this plane, and indeed Boeing has stopped production because of the lack of orders. It is really only suitable for the medium volume low cabin-service hub to hub routes which Finnair operates on it’s once a week charter or "tourist" routes. Residents of Helsinki term them "guinea pig cages", due to their extremely dense seating. They are one class planes, termed ‘punishment class’ by regular passengers. The Boeing 757-200 is the smaller variant of the 757s, but that advantage is sacrificed in terms of a smaller range, seating 227 in just one class, but with a range of just 3,200 miles. Some of these are quite old, with the oldest built in 1989. The most sought after seats in the 757-200s are in rows 11 and 30, the emergency exit rows, where there is a whopping 38 inches of legroom. however here the window seat F is missing. Finnair used to have a fleet of ancient McDonnell Douglas planes. They were well looked after, so the age is not really an issue, but even so these are wacky planes with the engines strapped to their backside. The idea (back in the days of really noisy engines) is that it's quieter for passengers in the expensive seats at the front. Very true, but if you're late at check in you'll get the window seat at the back of the plane, and spend the flight looking out over a great view of engine cowling. It'll be several hours after the flight lands that your ears stop bleeding and you can hear again. Finnair had six MD82, which seat 162, and five MD83, which seat 149. The layout of the aircraft are pretty much identical, with two seats on the left of the aircraft, three on the right - so you're better off in seats A and B. There's a wacky formation with the galley at the back of the aircraft on the left - so if you sit opposite the galley in row 28 you get very quick service. Finnair have replaced all the MD82s with Airbus A320 aircraft. Finnair had six McDonnell Douglas MD-11s, and you had to be lucky (or rather, unlucky) to get one of these unusually shaped beast of a plane. Finnair was one of the last airlines still using the MD-11s, which have now all been replaced by the Airbus A340. The MD-11s are very distinctive, the only tri-engined wide-body airliner still made - with an engine high up in the tail. Less than 190 MD-11 have been constructed, making it a commercial failure, and when it first took to the air several airlines promptly cancelled their order as soon as they had a chance to fly it. However Finnair have stuck with the plane, perhaps because in December 1990 it was the launch customer, and indeed first flew the plane in revenue service (on a run to Tenerife). Commentators have persistently raised safety questions over the airliner, due to refinements that give it relaxed aerodynamic stability. However this has not as yet been definitely linked to a number of high profile crashes, when the aircraft has flipped upside down, which could be a statistical anomaly. No Finnair MD-11 has been involved in such incidents. Most people try very hard to avoid the MD-11, as it is pretty cramped. Incredibly, Finnair have just bought another one. Finnair also look after the MD-11s which Lufthansa have converted to freight use. Business Class comes in a 2+3+2 formation, with five rows in the nose of the plane before the galley, an 2 after the galley. Row 6 has extra legroom. However it does have the video screen right in front of you. Seat pitch is 50 inches, and are quite wide with nice fold out wings for the headrest, however the seats do not fold totally flat. The three seat controls are in the armrest, for push buttons for recline, legrest, and lumbar support. There is a good fold out video screen, and a power socket for a laptop computer (low down in the centre pillar of the two seat unit). Economy seats come in two variants. Before the middle galley seats are in a 3+4+2 format, and after it are in a 3+4+3 (or occasionally a rare 2+5+2) formation, which seems to give a greater feeling of width than most other airlines - unless you're stuck in the middle of a row of D. Seat pitch is 32 inches. Row 42 is an emergency exit, giving much more legroom. All economy entertainment in MD11s is via overhead CRT TV screens in the ceiling, plus a few LCD screens at the front of the cabin - all in all a great 1970s experience. There are the usual satellite phones at each seat in business class (€7 a minute) and around the doors in economy. On Boeing MD-11 aircraft there is a telefax at the Purser's workstation. The Purser can use this to send faxes to the ground. It is not possible to receive faxes. The sending of faxes is priced at the same level as the use of the satellite telephones: the minimum charge is one minute (7 euro), after which the price is 3.50 euro per half minute.